London – Just a few doors down from 221b Baker Street, the home of fictional British detec­tive Sherlock Holmes, a new Egyptian bookshop has opened in London, seamlessly join­ing the cultural fabric of the British capital. Well-known Egyptian bookseller ALEF has opened its first interna­tional branch in London, catering to the city’s large Arab expat com­munity, as well as other Londoners who want to learn more about the Middle East, or buy a Sherlock Hol­mes book. “We have had a very positive re­action to the [London] store with people visiting and following us on social media through Facebook, Twitter and Instagram. It is all very early days yet,” store manager Fa­rah Taylor said. “It would be great to see more of the Arab community visit the store. We have a wide selection of books available in Arabic, including chil­dren’s books, as well as a great col­lection of Arabic authors translated into English,” she added. The London store, bright and well-lit, has tables of books show­casing English-language volumes on the Middle East, or English-lan­guage translations of well-known Arabic novels, alongside book­shelves of more regular fare. An inconspicuous alcove close to the front counter leads to the Arabic section, which offers a fine selec­tion of Arabic-language novels and non-fiction. ALEF was founded in 2009 as a unique upscale bookstore for Egypt’s urban elite, competing with the more-established Diwan Book­store. Within its first year, ALEF underwent rapid expansion, open­ing six branches across the coun­try. ALEF now has 33 stores across Egypt, in addition to its new Lon­don shop. The chain mastered social media to attract new customers and keep previous visitors coming back. It also launched the Knowledge Taxi project in 2010 to much critical ac­claim, turning a number of Cairo’s taxis into mobile libraries. ALEF’s London branch opens at a time when the UK bookseller industry is going through a transi­tion period with the number of in­dependent bookshops in decline and stiff competition among major chains due to the rise of Amazon and ebooks. 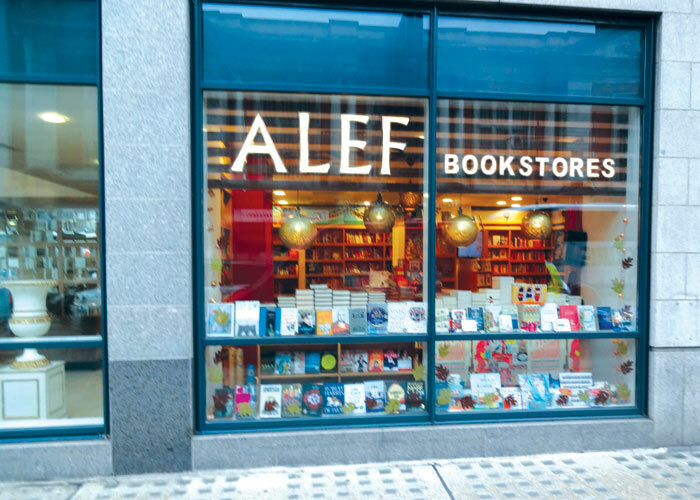 But ALEF has a trick or two up its sleeve and will seek not just to be a bookstore but also a cultural hub for London’s Arab commu­nity, which is one of the largest in the world outside of Arab nations themselves. ‘We intend to host book sign­ings, talks and children’s story-time sessions and maybe even an Arabic Book Club from early next year. I want to carve out an events programme that is a little different to your average high street book­shop. An events programme that celebrates our Middle East herit­age with a variety of events in both English and Arabic,” Taylor said. London has another major Ara­bic bookshop — Al Saqi Bookshop — which has been serving London’s expat Arab community since 1978. But Taylor said that London is big enough for two Arabic bookstores. “We are not seeking to compete with Saqi Books. Our store is very different in nature to Saqi,” she said. “Primarily, we have a large children’s section and are trying to appeal to the whole families. We are a store where Mum, Dad, your 3-year-old and your teenager can all purchase books, whether they are Arabic or English. According to its mission state­ment, ALEF aims “to create high­ly knowledgeable, intellectual and well-read Arab communities throughout the world”.